The citadel is a Covenant base structure, and the Covenant equivalent of the UNSC Firebase in Halo Wars. It contains a Command Center, seven building sites, and four turret foundations. When a new base has been claimed in standard Skirmish or multiplayer mode, the beginning base facility is called the Outpost (not to be confused with the Banished structure of the same name). It includes a Command Center and three building sites, but no turret foundations. Outpost can be upgraded to a Keep, which includes a Command Center, five building sites and four turret foundations, and can be upgraded to a citadel. A Covenant Minibase on Arcadia. 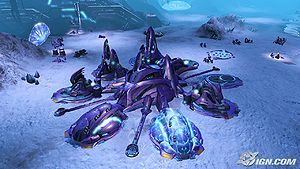 The citadel is a basic command structure with defenses such as Wraiths, Ghosts, and Banshees, and can also be defended by base turrets. It also has a similar underground garage to the UNSC's Firebase. These provide field command facilities for invading or defending Covenant Armies. Much like its UNSC equivalent, it possesses seven expansion "sockets" for more structures for research, unit production and defense. Where UNSC Firebases and Banished Outposts are prefabricated and airlifted into the battlefield large transport craft such as the D20 Heron, D81-LRT Condor or Lich, Covenant citadels and their supporting sub-structures are teleported into the battlefield whole. From here, supplies are driven into the base via gravity lift and stored in the Warehouses. Once established, a large Teleportation pad is established in the front of the base, which can be used to move troops and vehicles to the front lines of the battle. The citadel does not appear to have any physical openings for which to enter or exit the base - troops simply use teleporters to enter and exit the base. When threatened, the base can lock down, which will establish a shield around the teleporter into the base to prevent unauthorised entry or exit into or out of the base. 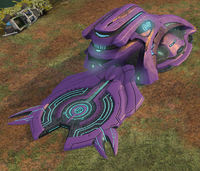 The Covenant also made use of Minibases, smaller outposts only capable of supporting one additional structure. They were notably employed during the Battle of the Etran Harborage, where they were used as forward airbases with which to construct Banshees and Vampires. Unlike their UNSC counterpart, there is no structure for the building of the Covenant minibase to attach to; simply a teleporter pad on the ground for troops and supplies to use to enter the lone building. A citadel is attacked by the Banished. Covenant citadels were employed by the Covenant during several battles in 2531. One was employed during the Harvest campaign, in which it was used to defend the Relic. Several were later used Battle for Arcadia; one was deployed in Pirth City to defend a Mega turret that was shelling the city, while another was deployed in the city's outskirts.. Several citadels and minibases were deployed under the protection of a massive Covenant dome, though they would eventually be destroyed by an Orbital bombardment. 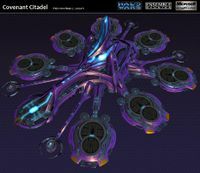 The Covenant would make extensive use of citadels during the Battle of the Etran Harborage. Shortly following the end of the Human-Covenant War, a citadel being used as an airbase by shipmaster Let 'Volir would be attacked by Atriox and his Banished forces. The citadel with no buildings or fortifications. The citadel is capable of hosting up to seven fortifications, alongside up to four turret slots. Concept art of a building for the Citadel. Concept art of the Teleporter pad on the front of the citadel. Concept art of the Covenant citadel. The citadel's turrets, building and teleporter pads. A render of the Covenant minibase with no attached buildings. A Citadel and a Covenant army supporting it.